A holiday in Fouesnant, in the heart of the Breton riviera. A dream come true ! Wide sandy beaches, clear turquoise waters, small coves shaded by umbrella pines and the Glénan islands on the horizon… welcome to Fouesnant-Les Glénan ! 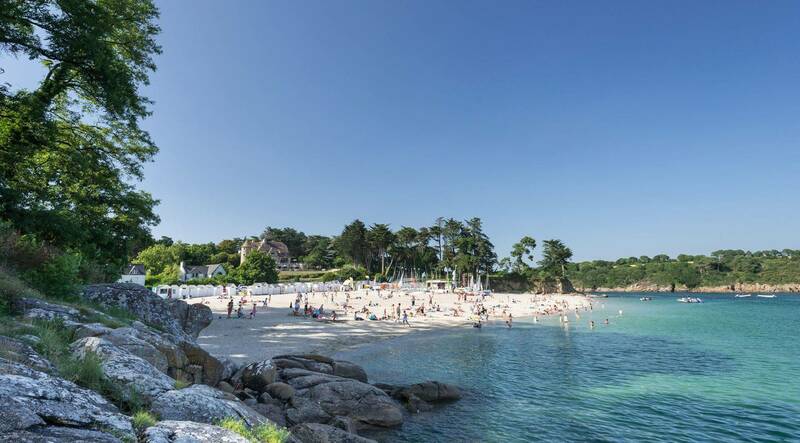 Today CAMPING PLUS BRETAGNE has a few tips on how best to discover this charming coastal resort in the heart of the Breton riviera, the most popular destination in Finistère ! If you walk along the coast from Pointe de Beg-Meil to Pointe de Cap-Coz, you will come across a succession of small creeks, most of which can only be reached on foot, by bike or even by boat. Some are big enough for a family picinc, others are hidden by the vegetation so you may have to make your way through the bushes to find a hidden cove where you can enjoy a romantic swim ! For families, we recommend the Dunes beach in Beg-Meil, one of the most popular in Fouesnant, or the nearby Kerambigorn Beach which has a kids’ club and where fun activities are organised during the summer. Whether you are a hiking enthusiast or just love beautiful seascapes, make the most of your camping holiday to explore the mythical customs officers’ path which takes you all around the Breton coast. At Fouesnant, 17 kilometres of the trail unfold spectacular scenery, sandy and rocky shores (Mer Blanche, Bot-Conan, Mousterlin, Penfoulic …) A complete change of scenery at every turn ! Shellfish gathering at the Cap-Coz headland is a favourite activity with campers. Get your boots on, get your equipment together (basket, bucket, net, rake, suncream…) and check the tide timetable and you’ll be ready to set off for a morning’s fishing with your family ! There’ll be no lying around sunbathing on the rocks here ! Hunt for shrimps, winkles, clams, crabs and limpets hidden under the sand or in the rock pools. The children will love it ! Fête des Pommiers, a highlight in Fouesnant in the summer ! If you would like to see Breton costumes and headdresses, don’t miss the local festival « Fête des Pommiers » which takes place every 3rd weekend in July. On the agenda of these two days devoted to Breton culture : a parade in traditional costume through the streets of Fouesnant, entertainment to the sound of « bagadou » (bagpipes), cider competitions, dinner of grilled meats, sea shanties and to end the festivities, a fest-noz (Breton dance) until late at night. The ideal opportunity to learn the steps of Breton dances !